The preliminary hearings for Jerry Sandusky's child abuse case begin at the Centre County Court in Bellefonte, Pa., a week from today, and an ABC News report indicates that all eight alleged victims will testify against him. Sandusky denied ever sexually abusing any child in an interview with the New York Times last week, and his lawyer, Joe Amendola, says that he's "looking forward" to questioning anyone who testifies against his client beginning next Tuesday, Dec. 13. "Although the preliminary hearing is not a trial, but simply a probable cause proceeding," Amendola said in a statement released yesterday, "we will, for the very first time, have the opportunity to face Jerry's accusers and question them under oath about their allegations." Previously, only one accuser was expected to testify at the preliminary hearings, and when the grand jury report was released, the identity of Victim 2—the boy that Mike McQueary allegedly witnessed being sodomized by Sandusky in a Penn State locker room shower in March 2002—was still unknown. Amendola told ABC that "he believed the defense knew who the boy was and talked to him." Last month, Amendola suggested that the person that the defense believes to be Victim 2—now in his 20s—is "adamant that nothing sexual occurred" in 2002. 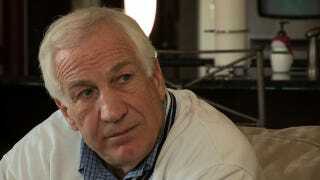 But ABC's report suggests that Victim 2 will join the others in testifying against Sandusky next week. It's not clear if the witness is the same person that Amendola claimed to have tracked down last month. The Centre County Court of Common Pleas said Monday applications for seating at the Dec. 13 preliminary hearing would be accepted for 24 hours on the county's webpage starting Wednesday at noon. A random drawing will then be held to assign seats. Those who get seats will be notified on Friday. Amendola says he believes others will come forward in Sandusky's defense next week.